A new Melbourne-based start-up, Farmwall, has started building vertical, edible farms that grow fresh produce inside some of Melbourne’s iconic cafes and restaurants, as part of a mission to transform cities into food-producing ecosystems. The three co-founders Geert Hendrix, Serena Lee and Dr. Wilson Lennard hope to show you that cities can live more closely to nature, and give cafes and restaurants a better – fresher – food experience. As a starting point, the Farmwall team created a scaled down version of an indoor farm. “If we have to start small, how can we achieve the largest reach?” was their thinking. In the size of a bookshelf, these vertical farms provide a consistent supply of fresh herbs and microgreens, at the fingertips of the chef. By growing produce on-site, Farmwalls reduce packaging waste and high food miles while introducing quality, freshness and variety into Melbourne’s hospitality scene. 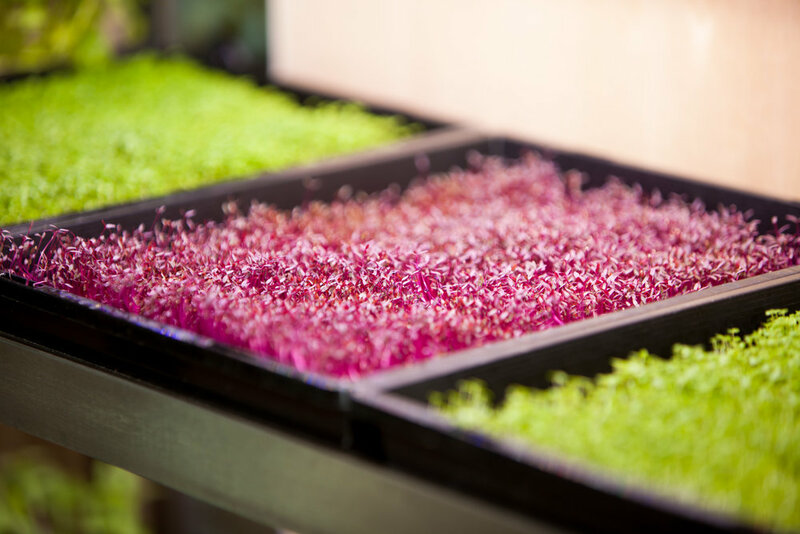 The small-scale farms have custom-designed facades and use aquaponic principles — meaning a beautifully-designed fish tank recirculates nutrient-rich water to each growing layer, topped with LED lights, bringing “farm-to-plate in under a minute.” Weekly visits are made bringing trays of sprouted seeds from the local, aquaponic farm. Chefs do the harvesting, urban farmers take care of the rest, building connections between patrons and the origins of their food. The team is installing the first two Farmwalls into Higher Ground and Top Paddock, two award-winning cafes owned by high-profile venue owner Nathan Toleman. There is a growing waiting list of venues that are eagerly waiting to be signed up next. Grappling with population growth but finite farming land, sustainable food practices and urban farming is a growing trend across major cities all over the world. Watch this space. Feb 22 Farmwall® Is First To Launch Innovative Vertical Farming In Two Iconic Melbourne Venues.